In the eighteenth century, rumors swirled about people accidentally buried alive when they lapsed into a deathlike state from cholera. As a result, the safety coffin was invented. Here's how it worked. From those eighteen century fears there arose a thriving cottage industry of inventors who promised to protect the seemingly-dead from being prematurely interred. Above you can see one of the more popular kinds of safety coffin, sometimes called an "escape vault," because each grave door was built as a hatch that could be opened from the inside. 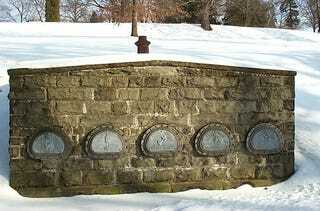 You can still see examples of these kinds of graves today. The one at the top is in Williamsberg, PA, created in the 1930s for Thomas Pursell (who was terrified of being buried alive) and his family. Each grave was felt-lined, and family members were buried with boards, tools, and bread, just in case they woke up and needed a snack before breaking out. Earlier examples of the safety coffin were even more elaborate, perhaps reflecting the gadget fetishism of the Victorian era. This coffin, like many safety coffins of the era, was attached to a tube that gravediggers or priests could look through and monitor. If they saw movement, or noticed that there was no smell of putrefaction, they were supposed to dig up the grave immediately. The tube could also conduct air into the coffin - a necessary feature that many safety coffins sadly neglected, despite providing other conveniences such as feeding tubes. Apparently, one inventor showed off his device by burying himself alive in it and having an assistant feed him sausages and soup through the feeding tube. Coffins from the eighteenth century sometimes came equipped with an elaborate bell system, which supposedly the trapped person could ring if they awoke six feet under. These rarely worked, however, since even if the person rang them, nobody was around to hear. Gravediggers were sometimes paid to keep watch over these graves and listen for the bells to go off. Today the safety coffin craze seems to have died out - perhaps because modern medicine allows us to determine whether someone is dead with a lot more certainty than in centuries past. But that doesn't stop people from dreaming about what they'd do if they awoke in their graves. One gadget nerd devised this coffin PC to save the prematurely buried from dying of boredom while they wait for rescue. No word on whether there are data plans that guarantee internet access in the grave. And members of the Six Feet Under Club have made a fetish of computerized coffins, staging events where they bury themselves alive with special friends and a webcam that offers voyeurs a live feed of what happens next. It just goes to show that one generation's greatest fear is another generation's sexual fetish.